years of cockpit duty supplied themes for an allegro first movement, published as Hangar Flying. The turbulent 1960s furnished a stage, the Cold War durable scenery, but the themes themselves echoed an oral tradition begun when pioneer airmen huddled around the stove on those bad-weather days and told stories about what they had done in the sky. Often these stories had a plot, some character development, a sense of time and place—all the properties of good fiction. But of course they were not in any way imaginary. The facts would have been polished, but the stories themselves were always true—true to the circumstances, to the individual, to history. The tempo slowed in a middle movement, the 20-year andante described here. Certainly, the Soviet threat imposed a constant, high state of readiness, but military professionals will recognize the motif: peacetime, in-garrison administration. For me, it was a time spent climbing the rungs of a large, complicated organization, a time of both rapid and slow promotion, of elation and disappointment, of good jobs and jobs I knew must be horrible, though as it turned out I never had a bad job. 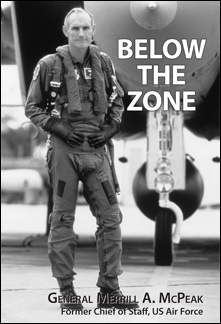 The opportunities and challenges took me to a variety of settings, making Below the Zone a sort of travelogue. But I intend something more: a modest contribution to the glut of how-to books on leadership and management currently warping library shelves. As this volume opens, I’d already had one or two short-term staff jobs, but the primary focus had been on membership in small units. In formations of squadron size or smaller, everybody knows everybody else, and the leadership qualities that count are, first, you must be competent—able to perform the task at hand yourself, and do it pretty well—and second, you must be trusted by teammates. These would not seem to be lofty goals: to be skilled at a job and deserving of trust. But in the military profession, these qualities take on special meaning. Competence means the ability to prevail in a fight to the death against determined opposition. And the trust must come from people who understand their lives, too, are at stake. In such conditions, there is no such thing as being too competent, or too trustworthy. In small units, both qualities are necessary; together they are enough. Now, in the 1970s and ’80s, I entered the world of medium- and large-sized organizations, a much more cluttered landscape, a zone of increasing ambiguity—the world of politics, broadly defined. To be sure, competence and trustworthiness continued to matter, but they would no longer suffice. Worse, these noble qualities often were (or seemed to be) in tension with each other. In these pages we will hear much less the incorruptible voice of the fighter pilot. Instead, a seasoned executive speaks of trade-offs, of the large and small compromises made getting to the top of any sizable organization, and then keeping it from jumping the tracks. Of course, it was during this 20-year period that we won the Cold War, though we should be precise about what actually happened: the Soviets lost it. A presto finale is still to come and must be written in yet another voice, that of a service chief, the uniformed head of one of our country’s armed services.